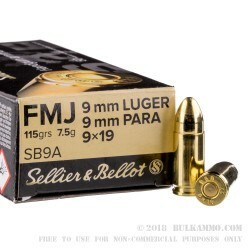 Sellier & Bellot’s 9mm Parabellum rounds are one of the most popular range loads for the cartridge thanks to their affordability and rock-solid performance. 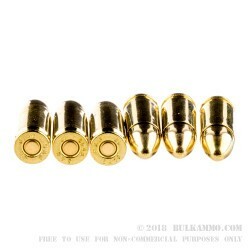 These rounds fire a 115 grain full metal jacket bullet at 1,280 feet per second, significantly faster than average for a very flat-shooting trajectory. Each cartridge in this box of 50 uses reloadable brass cases and non-corrosive Boxer primers. Founded in 1825 in Prague, Sellier & Bellot is one of the oldest ammunition manufacturers in the world. It was established by French industralists (for whom the company is named) to fulfill percussion cap contracts for the Austrian Empire. Now located in Vlasim in the present-day Czech Republic, S&B has survived many market disruptions including government takeovers and the obsolescence of its main original product. The company exports two thirds of its output to 70 countries worldwide, with a significant amount going to the US. Shot well enough. And the price decent, maybe a little dirty, but what isn't. put about 150-200 rounds through my sd9ve had one round fail to feed properly, but other than that one issue no real complaints really. I've used S&B ammo for years without any problems. For just a little more than steel casing ammo, you can get this stuff. Shoots clean and fairly straight, making it the prefect choice over reloads for target shooting. Had the ammo in three days.Fired 200 rounds in my Ruger SR9C no problems. I have fired 400 rounds through a PX4 Compact. No issues. I don't know why the ammo isn't rated +P. The muzzle velocity and energy value is in a +P range. 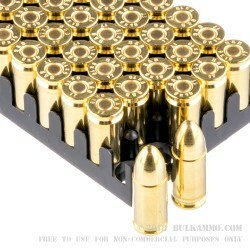 Would definitely buy this ammo again. Fire almost 2000 rounds of this ammo not one fail yet. 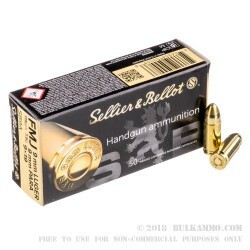 Price here on Bulkammo is the best so far for this ammo brand. will continue to use. SA XDm 9mm eats this rounds with ease.. The quality of this ammo goes without question, it is reliable and for the price a real bargin.